Abaqa on a horse. His son Arghun stands beside him under a royal umbrella, with his own son, Ghazan, in his arms. Rashid-al-Din Hamadani, early 14th century. Abaqa was born in Mongolia in February 1234, son of Ilkhanate founder Hulagu Khan. Abaqa himself was Buddhist. A favored son of Hulagu, he was made governor of Turkestan. Hulagu died from illness in 1265. Before his death, he had been negotiating with the Byzantine Emperor Michael VIII Palaiologos to add a daughter of the Byzantine imperial family to Hulagu's number of wives. Michael VIII had selected his illegitimate daughter Maria Palaiologina, who was dispatched in 1265, escorted by the abbot of Pantokrator monastery, Theodosius de Villehardouin. Historian Steven Runciman relates how she was accompanied by the Patriarch Euthymius of Antioch. Since Hulagu died before she arrived, she was instead married to Hulagu's son, Abaqa. He received her hand in marriage when he was installed as Ilkhan. When Hulagu's wife Doquz Khatun died in 1265 as well, the role of spiritual leader transferred to Maria, who was called "Despina Khatun" by the Mongols. It was Abaqa who decided on the permanent location for the Ilkhanate capital, Tabriz, which was in the northwestern grasslands that the Mongols preferred. Abaqa took power four months after the death of his father, and then spent the next several months redistributing fiefs and governorships. Some of the coins from Abaqa's era display the Christian cross, and bear in Arabic the Christian inscription "In the name of the Father, the Son and the Holy Spirit, only one God". Since Hulagu's reign, the Mongols of the Ilkhanate had been at war with the Mongols of the Golden Horde. This continued into Abaqa's reign, and the Golden Horde invaded the Ilkhanate in the Spring after his accession. Part of this was due to an alliance between the Golden Horde and the Egyptian Mamluks, in that the Golden Horde was attempting to distract Abaqa on one front, to keep him from invading Mamluk-held Syria on another. The hostilities continued until the death of the Golden Horde's khan Berke, in 1267. The Great Khan Kublai attempted to intervene, to stop civil war, and due to his influence, the Golden Horde's khan, Möngke Temür did not launch a major invasion of Abaqa's territory. However, Möngke Temür still established an alliance with the Egyptian Mamluk sultan Baibars promising that he would attack Abagha and share any conquered territories. However, at the same time, Möngke Temür also sent envoys to congratulate Abagha when the Ilkhan defeated Ghiyas-ud-din Baraq. In 1270, he allowed Mengu-Timur to collect his revenues from workshops in Iran. Ögedei's grandson Kaidu, Batu's grandson Mengu-Timur and Baraq of the Chagatai Khanate formed an alliance against Kublai Khan and Abagha in Talas. They appointed Kaidu a ruler of Central Asia. The Kaidu–Kublai war lasted for a few decades. In 1270, Baraq Khan of the Chagataids tried to annex Iran, which started a new war against Abaqa in the city of Herat, though Abaqa was able to launch a successful defense and, also, defeated Baraq's relative Teguder in Georgia. In the following year, he retaliated by sending an army against the Chagatai Khanate. They plundered Bukhara and surrounding areas. There were small conflicts between Abagha and Qara'unas under Chagatayd noyans until 1280. Abaqa was one in a long line of Mongol rulers who attempted to secure Western cooperation against the Muslim Mamluks. He corresponded with Pope Clement IV through 1267-1268, and reportedly sent a Mongol ambassador in 1268, trying to form a Franco-Mongol alliance between his forces, those of the West, and those of his father-in-law Michael VIII. He received responses from Rome and from James I of Aragon, though it is unclear if this was what led to James's unsuccessful expedition to Acre in 1269. Abaqa is recorded as having written to the Aragonese king, saying that he was going to send his brother, Aghai, to join it when it arrived in Cilicia. Abaqa also sent embassies to Edward I of England, and in 1274 sent a Mongol delegation to Pope Gregory X at the Second Council of Lyons, where Abaqa's secretary Rychaldus read a report to the assembly, reminding them of Hulagu's friendliness towards Christians, and assuring them that Abaqa planned to drive the Muslims from Syria. But neither this diplomatic mission, nor two further embassies to Europe in 1276 and 1277, brought any tangible results. Bohemond VI of Antioch, under the influence of his father-in-law Hetoum I of Armenia, had voluntarily submitted to Mongol authority in 1260, while Abaqa's father Hulagu was in power, making Antioch and Tripoli vassal states of the Ilkhanate. In 1268, the Mamluk leader Baibars captured Antioch, and Bohemond obtained a truce with Baibars in order to keep from losing Tripoli as well. In response to the fall of Antioch, Edward I of England arrived in Acre in 1271, trying to lead a new Crusade. It was ultimately considered a military failure, but Edward was able to eventually secure a truce with the Mamluks before he had to return to England. After talking over the matter, we have on our account resolved to send to your aid Cemakar (Samaghar) at the head of a mighty force; thus, when you discuss among yourselves the other plans involving the afore-mentioned Cemakar be sure to make explicit arrangements as to the exact month and day on which you will engage the enemy. —  Letter from Abaqa to Edward I, September 4, 1271. The Mongols, including some auxiliary Seljukid troops, ravaged the land from Aleppo southward. Though the force was relatively small, they triggered an exodus of Muslim populations (who remembered the previous campaigns of the Mongol general Kitbuqa) as far south as Cairo. Edward, for his part, was never able to muster his own forces to coordinate actions with the Mongols or even achieve any military victories whatsoever, and Abaqa's forces eventually withdrew. When Baibars mounted a counter-offensive from Egypt on November 12, the Mongols had already retreated beyond the Euphrates. The Mamluk leader Baibars died in 1277. In 1280-1281, Abaqa promoted new attacks against Syria. In September 1280, the Mongols occupied Baghras and Darbsak, and took Aleppo on October 20. The Mongols sent envoys to Acre to request military support for their campaign, but the Crusaders were still in a 10-year truce with the Mamluks. The Vicar of the Patriarch declined Abaqa's request, saying that the city was suffering from hunger, and that the king of Jerusalem was embroiled in another war. The King of Cyprus Hugues III and Bohemond VII also mobilized their armies, but could not intervene because the Mamluks had already positioned themselves between them and the Mongols. Abaqa and Leo III urged the Franks to start a new Crusade, but only the Hospitallers and Edward I (who could not come for lack of funds) responded favourably. The Hospitallers of Marqab made combined raids into the Buqaia, and won several engagements against the Sultan, raiding as far as the Krak des Chevaliers in October 1280, and defeating the Mamluk army of the Krak in February 1281. The Mongols finally retreated, pledging to come back for the winter of 1281. They informed the Franks that they would bring 50,000 Mongol horsemen and 50,000 Mongol infantry, but the request apparently remained without a response. Defeat of the Mongols (left) at the 1281 Battle of Homs. The Egyptian Muslims had respected a 10-year truce with the Crusaders which began in 1271. On May 3, 1281, the new Muslim sultan Qalawun signed a new 10-year truce with the Barons of Acre and a second 10-year truce with Bohemond VII of Tripoli, on July 16, 1281. The announced Mongol invasion started in September 1281. They were joined by the Armenians under Leo III, and by about 200 Hospitaliers knights of the fortress of Marqab, who considered they were not bound by the truce with the Mamluks. 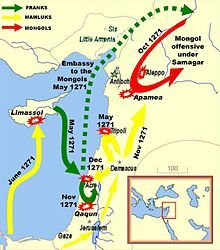 On October 30, 1281, 50,000 Mongol troops, together with 30,000 Armenians, Georgians, Greeks, and the Hospitalier Knights of Marqab fought against the Muslim leader Qalawun at the Second Battle of Homs, but was beaten back. Abaqa died at Hamadan on 1 April 1282, probably in a state of delirium tremens. This illness was probably caused by too much consumption of alcohol, a habit common to many Mongol leaders. However, in 1285, his minister of finance Shams ad-Din Juvayni was accused of having him poisoned. After Abaqa's death, his widow Maria fled back to Constantinople where her father, apparently wishing to spare his capital the fate that befell Baghdad, tried to marry her off again to another Mongol khan. Maria could not accept the offer, became a nun, and founded the church of Panagia Mouchliotissa around 1285. Abaqa was succeeded by his brother Tekuder, who despite his earlier conflicts with the Egyptian Mamluks, had converted to Islam. Tekuder reversed Abaqa's pro-Christian policies and proposed an alliance with the Mamluk Sultan Qalawun, who resumed attacks on Frankish territory, capturing the northern fortress of Margat in 1285, Lattakia in 1287, and Tripoli in 1289. In 1284, Abaqa's son Arghun led a successful revolt, backed by Kublai. Arghun had his uncle Tekuder executed and took power himself, returning to the pro-Christian policies of Abaqa. A younger son, Gaykhatu, assumed the throne in 1291. ^ Histoire des Croisades III, René Grousset, p.653. ^ The Crusades Through Arab Eyes, p. 253: The fortress of Marqab was held by the Knights Hospitallers, called al-osbitar by the Arabs, "These monk-knights had supported the Mongols wholeheartedly, going so far as to fight alongside them during a fresh attempted invasion in 1281." ^ Guida Myrl Jackson-Laufer (1999). Women Rulers Throughout the Ages: An Illustrated Guide. ABC-CLIO. p. 319. ISBN 9781576070918. Retrieved 2012-06-23. ^ Ann K. S. Lambton (1988). Continuity and Change in Medieval Persia: Aspects of Administrative, Economic, and Social History, 11th-14th Century. SUNY Press. ISBN 9780887061332. Retrieved 2012-06-23. ^ "Padishah Khatun (Safwat al-Din Khatun): 13th Century". Women in World History. Retrieved 2012-06-23. Amitai-Preiss, Reuven (1995). Mongols and Mamluks: The Mamluk-Īlkhānid War, 1260-1281. New York: Cambridge University Press. ISBN 0-521-46226-6. Runciman, Steven (1987 (first published in 1952-1954)). A History of the Crusades 3. Penguin Books. ISBN 978-0-14-013705-7. Tyerman, Christopher (2006). God's War: A New History of the Crusades. Cambridge, Massachusetts: Harvard University Press. ISBN 0-674-02387-0.